Self-Actualization is that state of self-awareness from where a person can take highly effective decisions and becomes a visionary thought leader. As a matter of fact, very few people of the world achieve self-actualization in their lives, resulting into an acute leadership shortage in almost all institutions today. This has resulted into ineffective utilization of Human and Material Resources of the planet, giving way to a large scale proliferation of corruption, inflation, recession, productivity losses, pollution of rivers, air pollution, economic turmoil, terrorism, family-feuds, increasing crimes, unemployment, disengagement, attrition, over-population, acute poverty and last but not the least, the dreaded global warming presenting a great danger to human civilizations. Our Founder and Chief Mentor, Mr. Hitesh Chandel, has done extensive research on scriptures, history, thought process of various philosophers, scientists, educationists, freedom fighters, politicians and management Gurus, to come up with an inclusive, exclusive and conclusive vision to develop the full potential of individuals and institutions and revive the overall Ecosystem of the planet for the betterment of all. 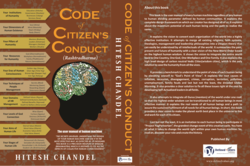 This vision is documented in a book titled “Code of Citizen’s Conduct” for which the Author, Mr. Hitesh Chandel, is conferred with “Pride of India Award”. Also, our company is conferred with 2015 Leaders Award under the category, “Fastest Growing Consultancy Brand for Human Resources in Delhi/NCR”. 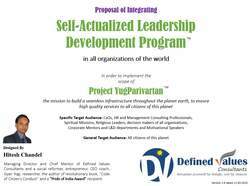 Self-Actualized Leadership Development Program (SALDP) is our flagship leadership consulting framework designed by synergizing the consciousness of various thought leaders of past and present eras, so as to develop the full potential of the participants, thereby substantially improving their personal and professional lives through a clearly laid out plan. The four level SALDP empowers the participants with the eternal principles of effective leadership, so as to transform the institutions they lead, into very highly effective institutions. SALDP also provides networking platforms for collaborative growth of individuals and institutions. SALDP is a grand thought revolution in the making. An organization is nothing but a group of individuals working together to achieve ‘Shared Vision and Mission’. In order to keep people aligned to the direction of Shared Vision and Mission, it becomes important to setup a value system which can bind people together. The “culture” of an organization may vary between various teams, business units, departments, branches or geographies, but the Value system is kept universal in order to maintain the integrity of the institution. While individuals and organizations continue to evolve their value system based on best of their wisdom; there is a value system which is eternally working in the Ecosystem. The more an individual or an organization align themselves to the eternally Defined Values system, the more effective they become in delivering value to their stakeholders. It is critical for the people on leadership positions or aspiring to take up a leadership position in future, to align themselves to these Defined Values, so as to become a role model for the people working under their area of influence. Even ordinary citizens can be transformed into highly effective change leaders, if the right advises and consultations are provided to them by high conscious mentors. Defined Values Consultants is founded with the sole purpose of aligning the individuals and institutions with the eternally Defined Values, through the deeply researched frameworks, training programs, tools, techniques, advisories and consultations. All organizations who wish to elevate the collective will of their workforce towards the Shared Vision and Mission of their institution, are invited to contact us for an Introduction presentation of our flagship “Self-Actualized Leadership Development Program” and transform their organizations into highly effective institutions. Individuals wishing to become a grand transformative leader, are requested to attend our upcoming free "Self-Actualized Leadership Seminar". The thought paradigm of management and leadership roles are not same. While a manager has to effectively manage the processes that are already established, it takes a leader to challenge the status quo and propose and act on creating new things or find better ways of doing the things. SALDP develops a participant into a ‘thinker’, with an improved understanding of how everything in the universe function, thereby making him an outstanding observer of the problems at hand. The areas of improvisation in the existing processes can be easily seen from the Self-Actualized state of awareness, thereby improving the overall quality of service of an individual and hence the institution he is working for. The effectiveness of a person’s work is a combined result of his Hard Skills (domain knowledge), Soft Skills and the Will (intent). While skills are important to perform work, it is the Will which makes all the difference. If the Will for the work is strong, a person stays self-motivated to acquire new skills and learn better ways of solving the problems at hand. SALDP develops the ‘Will to Work’ in people, by aligning their thought process with the Eternal Principles. The high energy generated due to enhanced Will and the alignment of thought direction with the Absolute Truth, results into higher productivity, performance, quality of service, contentment and a faster growth in personal and professional life. Managing human beings is one of the most difficult task from amongst the plethora of tasks that we do in our personal and professional lives. The effectiveness of a person on other human beings is a direct outcome of his understanding of the principle of interdependence and his harmony with the self and surroundings. SALDP takes the participant to the higher zones of self-awareness, thereby making him cognizant of the interdependence eternally working throughout the Ecosystem. A participant is shown a lot of visual models to understand other’s reference points, so as to handle the Ego clashes and Emotional weaknesses of self and others very effectively, even under very difficult situations. This results into an increased influence of the participant on other human beings thereby reducing the roadblocks that prevent one from working in a collaborative manner. One of the biggest factor affecting the institutions today is attrition of employees and the disengagement of the ones who continue to stay with the company. This results into a lot of wastage due to the cost incurred in refilling the vacated positions, or taking work from half-heartedly working employees. Integration of SALDP in the organizational setup would ensure that workforce remain charged-up by working under the supervision of self-actualizing managers and leaders. The integration of an organization with Vedic Wisdom Group after Level 3 of SALDP would ensure that employees of member organizations would continue to get new and challenging roles through the centralized human resource planning. 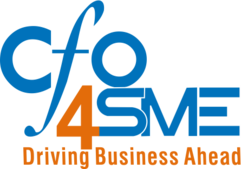 Becoming a member of this networking platform would also open up several business opportunities with the other member organizations. The various collaboration platforms within the Vedic Wisdom Group would lead to high synergy, resulting into reduction in the wastage or underutilization of human and material resources management of an organization. Also, new career paths would open up for participants including the heads of institutions, to grow to a further bigger role than what they have handled so far in their career, including joining us as an SALDP trainer. An SALDP Center of Excellence (CoE) would be established in all Vedic Wisdom Group organizations, so that the highly effective leadership pipeline could be created in a sustained manner. In addition to training leaders and managers of an institution through the Institutional track, we are also developing and networking leaders through the Individual track of SALDP. The SALDP trained Self-Actualized Leadership Network (SALN) members would act as a high energy resource pool for participating organizations. Doing business today is becoming more and more difficult due to the deteriorating conditions of the Ecosystem. The severe issues affecting the Ecosystem today like inflation, recession, corruption, resource shrinkage, terrorism, pollution, choked cities, political logjams, family feuds and last but not the least, the increasing natural disasters due to global warming, are affecting the psychology of the human beings drastically, thereby reducing the quality of their decision making. This is ultimately reflecting badly on the Economy, making the business environment challenging by the day. Integration of Institutions with Vedic Wisdom Group would ensure that the negative effect due to the above issues are substantially reduced for all the participating organizations. Setting up of one’s own venture always require more than a product or service idea. There are a lot of other things that an entrepreneur has to do to make a venture successful. Every venture whether it is a for-profit institution or a Non-Government Organization, requires investments in terms of time, money, energy, right resources and a steep learning curve with virtually no profits during the founding years. Several times an enterprise fail to achieve break-even point in expected timeframe resulting into closure of the company. Participation in SALDP will ensure that several of these early stage challenges could be taken care, before a person decides to take up his entrepreneurial venture full time. Learning in a group with people from other institutions and professions, opens up several opportunities of networking with other participants through the platforms being built by Defined Values Consultants. It results into enhanced possibilities of finding the clients, right business partners, investors and SALDP trained human resources. Participation in SALDP by becoming a member of SALN opens up a door to several opportunities to develop one’s leadership acumen, which includes involvement in SALN activities and getting short-term or long-term paid assignments from Defined Values Consultants and allied institutions. Becoming a member of SALN also opens up a possibility of getting a full time leadership position in Vedic Wisdom Group of Institutions or a client organization in our network. Participation in SALDP makes a person cognizant of higher purpose of human life, which results into a better sense of understanding of the world around, thereby improving the overall quality of living and working. SALDP provides a straight forward path towards one’s spiritual awakening and liberation. The unique visual models shown during the presentations leave no doubt about the working process of human mind (ego, emotions, intellect and memory) and the soul (Absolute Wisdom). 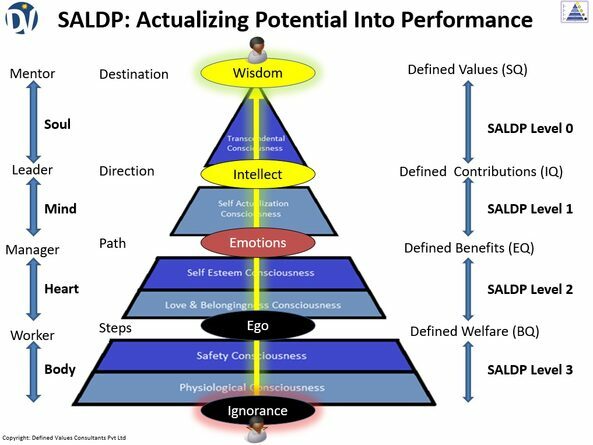 Non-SALN Members, who want spiritual wisdom but do not want to take up a leadership position, would be equally benefited by attending SALDP through Non SALN Track, and would achieve enlightenment by following on the path shown during the SALDP sessions. The various paths to become a member of our high conscious collaboration groups is shown in the picture below. The encircled numbers 0 through 8 depict the various development paths in our systems. The 9 options are explained as under. Path 8 - DVBN Associate: Business Owners, Freelance professionals and Entrepreneurs looking for a well-organized Referral Network system can choose this path to expand their contact circle. First year annual subscription fee is waived-off. Path 7 - SALDP Alumnus: SALDP Graduates who do not wish to become part of our Network and want to utilize the learning from the SALDP into their own mission outside our system, become the SALDP Alumnus after SALDP Graduation. Path 6 - DVTN Associate: Domain Trainers, Life-coaches, Keynote Speakers, Business Coaches, Advisors, Communication Skills Trainer, Behavioral Skills Trainers, Motivational Speakers, Other Soft-skills trainers and Educators, who wish to become part of an organized community of training professionals and aggregate with DVTN can take this path. 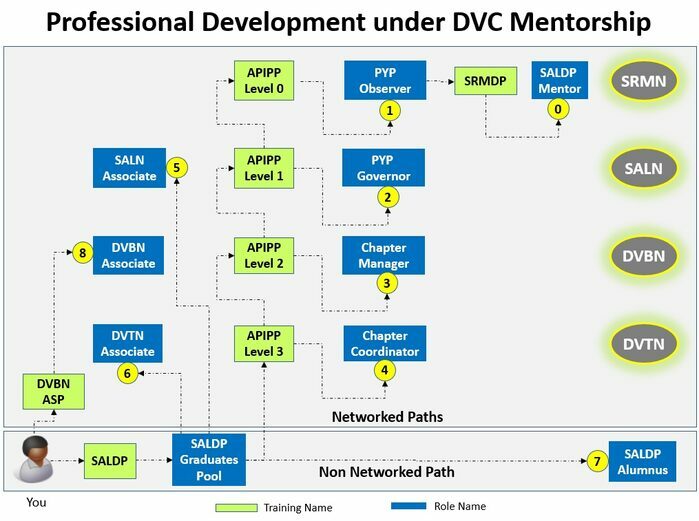 SALDP Graduation is compulsory to become an DVTN Associate. Path 5 - SALN Associate: SALDP Graduates who wish to do Mission Networking with other SALDP Graduates can become a member of SALN. Path 4 - Chapter Coordinator: SALDP Graduates who select their worker dimension of mission as PYP (Project YugParivartan) are given a public facing role for all events of a Chapter to increase their Space of Influence. A SALDP Graduate has to complete APIP Level 3 to become a Chapter Coordinator (APIPP is a 4-Level program to implement the learning of SALDP in real public life. APIP is Actualize Potential Into Performance). Path 3 - Chapter Manager: This path enables a SALDP Graduate to manage upto 5 Chapters of DVG. This gives a great professional exposure to SALDP Graduates, leading to enhancement of their earning potential and visibility. A Chapter Manager also plays the role of Account Management and Customer Relationship Management for DVTN and DVBN chapters. The SALDP Graduate needs to complete APIPP Level 2 to achieve this position. Path 2 - PYP Governor: This path enables a member to join Project YugParivartan Administrative Services. It enables a person to become an outstanding reformer and the primary conduit in implementing the vision of Project YugParivartan. PYP Administration leads a person to become part of Board of Directors of several DVG Affiliate Companies and also get Administration fee as compensation. The SALDP Graduate needs to complete APIP Level 1 to achieve this position. Path 1 - PYP Observer: This path enables a member to act as Auditor/Observer of leaders in PYP Administration. A PYP Observer also gets monthly compensation. The SALDP Graduate needs to complete APIPP Level 0 to achieve this position. Path 0 - SALDP Mentor: This is a path for becoming a Self-Realized Guru and a messenger of Absolute Truth. It requires a person to complete all Levels of SALDP, APIPP and SRMDP. SRMDP is the Train the Trainer program for SALDP coaching. This is the most rigorous of all offerings of DVC. The SALDP Mentors are entitled for compensation for delivering SALDP Workshops. Option 1: Keep a watch on announcement of the upcoming Seminars on our website. Option 2: Request for a Seminar at your institution (at least 15 participants from your company are required for the same). Option 3: Schedule a meeting with one of our mentors at our Corporate Office in Gurgaon. *The SALDP Introduction workshop is currently available for free in Delhi, Faridabad, Gurgaon and Noida only). For other cities boarding and lodging expenses need to be taken care by the requesting organization. Call us at 9810375146 to book the Seminar. - Dilip Rathi, Managing Director, Etre Luxe India Limited. - Garima Tripathi, HR Head, Etre Luxe India Limited. - Kamal Rathi, Director, Etre Luxe India Limited. - Namrata, Interior Designer, Etre Luxe India Limited.